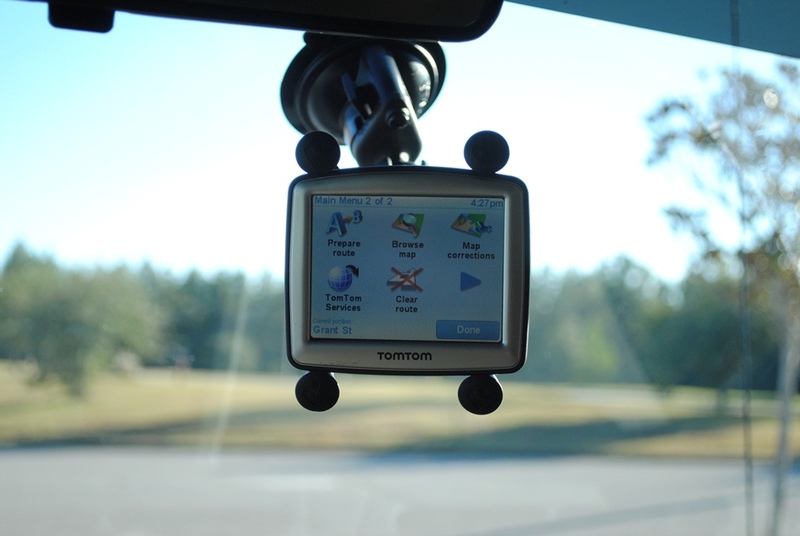 Looking back at our beginnings our very first review was on the RAM Mounts Aqua Box. Still, after all this time, it’s our most used accessory. Maybe we have trouble severing the ties with our work lives that we have to have our phones on the trail. 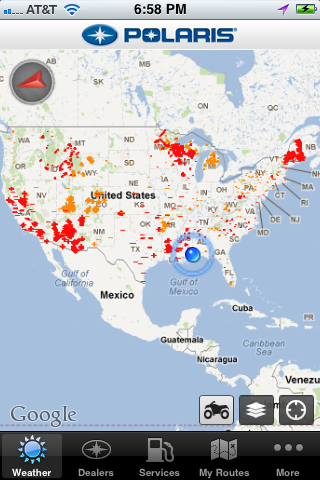 Maybe it’s the hope that our cell signal will be good enough to show the satellite view to get us unlost if needed. Or maybe it’s because we want to quickly call 911 for a medevac the next time someone (who shall not be named) stalls climbing a steep hill and decides to let their ATV ride them back down. Either way the Aqua Box is a staple to our rides. So when we picked up our 2014 Honda Rancher one of our first calls was to RAM Mounts for a new one. Technology changes daily and the engineers behind the Aqua Box haven’t been idle either. They introduced us to the Ram Mounts Aqua Box Pro, a new line that provides even more options. 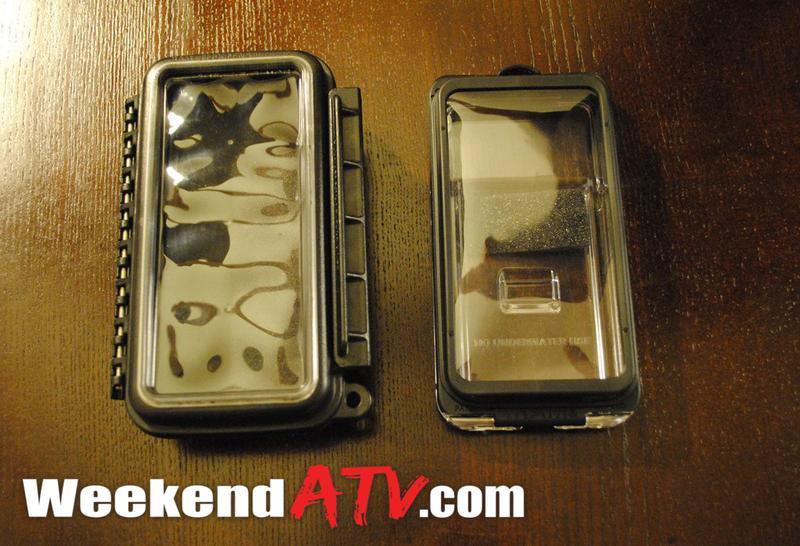 The RAM Mounts Aqua Box (left) and the RAM Mounts Aqua Box Pro (right). The RAM Mounts Aqua Box Pro differs from the original Aqua Box in several ways. The Aqua Box Pro is still weather-resistant/splashproof, though not quite as much as the original. It’s quick release system allows the Pro to be removed from the mount and carried in your pocket. The new membrane allows full control of buttons on the front and sides of the device as well as full control of the screen, even swiping. The back of the Pro is clear allowing photos and videos to be taken without removing the device from the Aqua Box Pro. There is even a little extra room in the case to hold a few small items like identification. As an added bonus the Pro floats, just in case. The RAM Mounts Aqua Box Pro is available in 3 sizes. The Pro 10 is sized for early generation versions of the Apple iPhone, without any case. The Pro 20 i5 is designed to fit the Apple iPhone 5 without any case. And the Pro 20 is designed to fit iPhones with cases as well as most other phones with interior dimensions of 2.8″ wide, 5.38″ high and 0.55″ deep. Being a big fan of protective cases we opted for the RAM Mounts Aqua Box Pro 20. 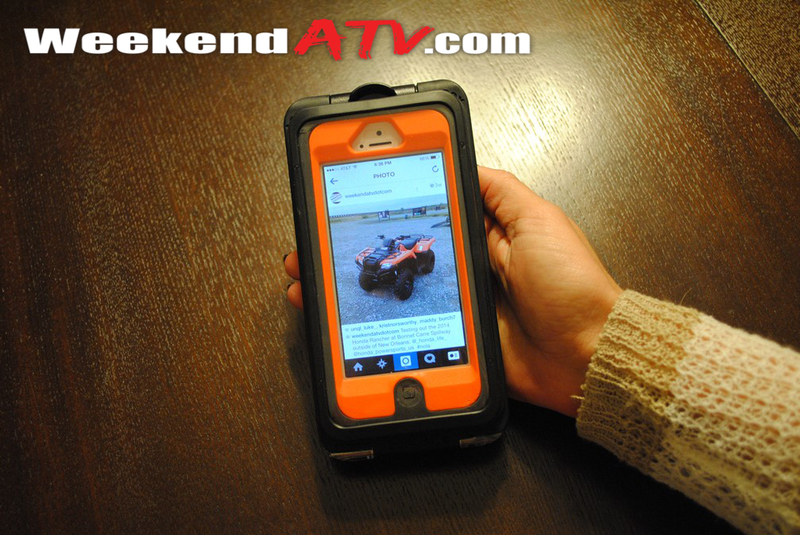 In our testing we were using Apple iPhone 4s and 5 devices housed in Otterbox cases. Swiping works good as well as most screen inputs. I did find that I had a hard time getting the Done button to respond when trying to unlock the screen. So much so that a crease has formed in the clear cover. This only seems to be an issue when using buttons in the corners of the screen. Other phone makes or using an iPhone without an Otterbox may have worked better. Navigating through Apps, photos, music, etc all ran smoothly otherwise. Also keep in mind that the Aqua Box Pro is not waterproof, so if you like to walk your snorkled quad across ponds then you should stick to the original Aqua Box. I had no issues during normal riding and mudding, but my phone did get wet at the bike wash afterwards. Overall the RAM Mounts Aqua Box line is a great solution for keeping your device accessible on a ride. You riding style or conditions may determine what model is best for you. Our setup as shown carries a reasonable MSRP of $61.06 and includes a lifetime warranty. Additionally, like all RAM Mounts gear, it’s made in the USA. 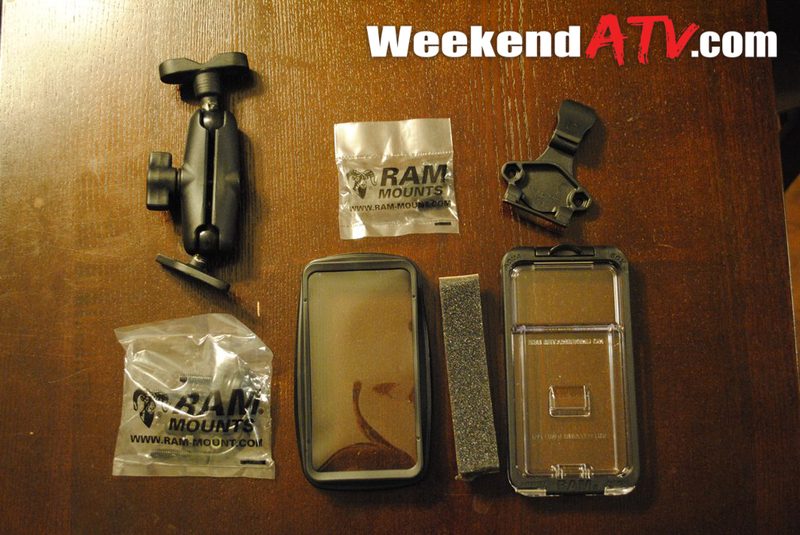 To pick out your own RAM Mounts Aqua Box Pro or other gear from Ram Mounts see http://rammount.com/. With any activity hydration should always be a consideration. 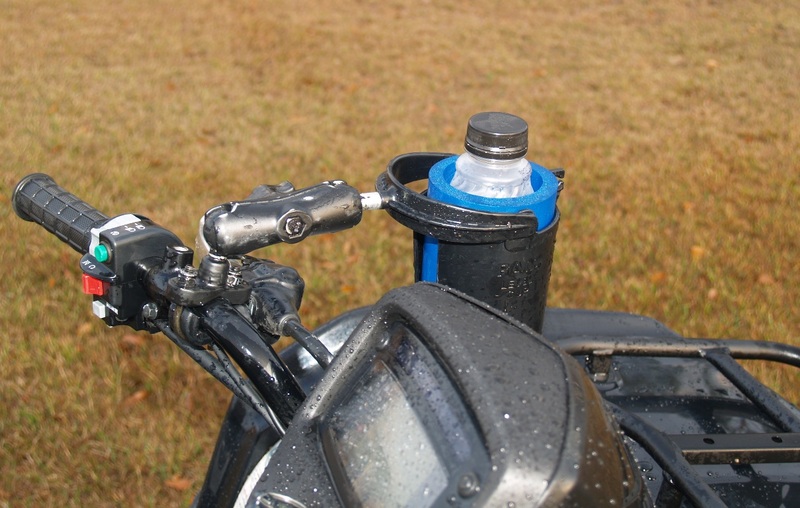 While ATV riding may often not be physically demanding it is important for your own health and safety to stay well hydrated. 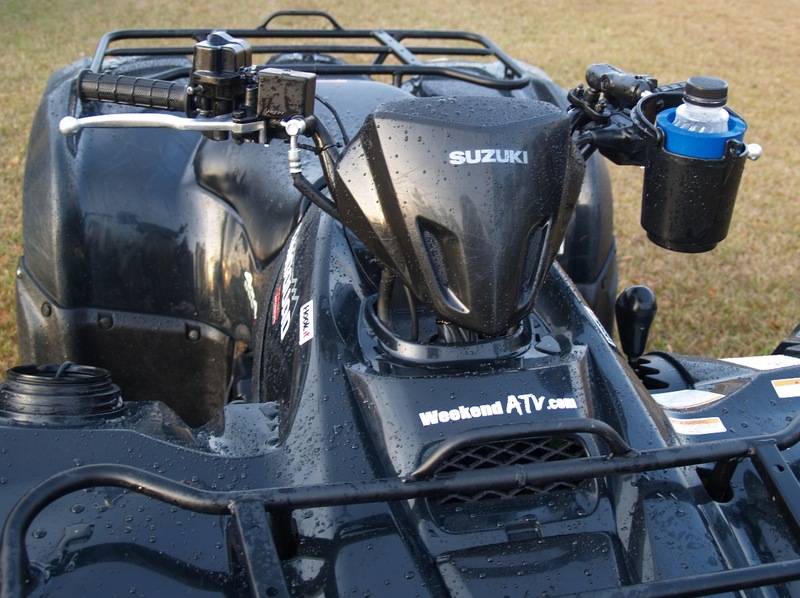 In recent years ATV manufacturers seem to be noticing this and are including cup holders built into many ATVs. However, there are still many models where an upgrade is required. Our friends at RAM Mounts are just the sort of supplier for this. I have been the lucky one to try out the RAM Drink Cup Mount (RAM-B-132RU). I have used it on a dozen or so trips and it really does the job. Like all of our RAM Mounts reviews, installation is extremely easy. The toughest part is deciding where to mount it. This is a true 5 minute install. The package come with a U-bolt mount, socket arm, and cup holder with a koozie. The mount and U-bolts attach to the handle bars (in my case) or any bar you wish from 0.5″ to 1.25″. The default U-bolt mount (RAM-B-231ZU) is not rust-proof. However, the rust-proof RAM-B-231U is at virtually the same price, but only accommodates 0.5″ to 1.0″ bars. 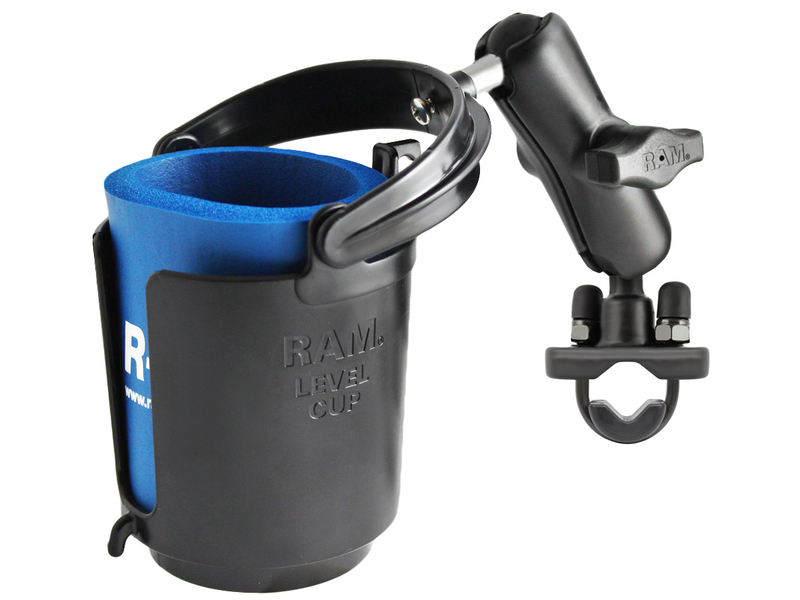 The 3″ long mount arm allows the cup holder to be mounted at almost any angle. The arm is very easy to tighten and does not move once properly secured. Finally, the cup holder attaches to the arm. With a 12 oz drink, the cup holder attachment allows for 360 degree movement for the roughest of rides. The koozie creates a snug fit for drinks of various size. Chances are you have some type of device mounted on your windshield or dash. 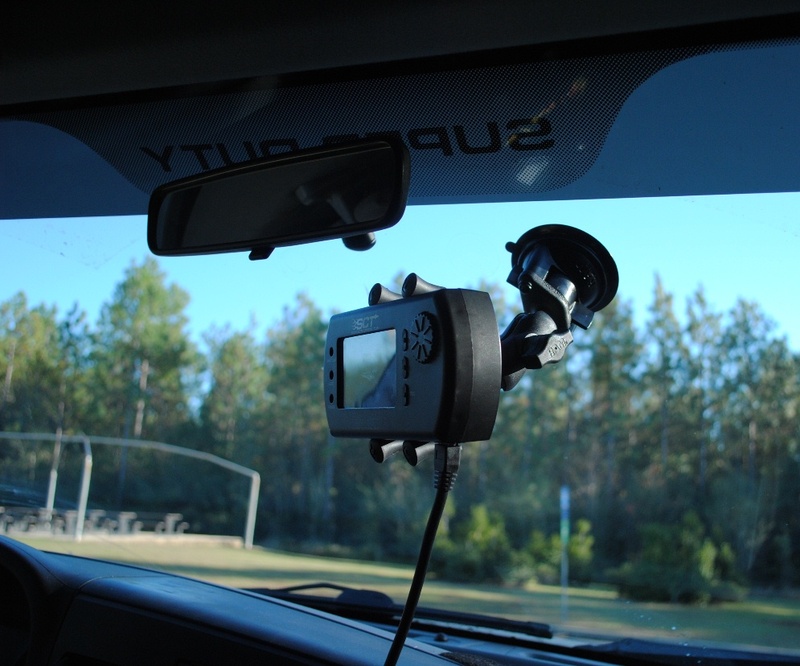 GPS, radar detectors, performance tuners and mobile phones are common, as are the rings left on the windshield from the suction cups. Some of these devices don’t include a mount requiring you to pay $30+ for $3 worth of molded plastic and suction cup. Others come with a mount that is difficult to replace or you end up trying some imported knock-off that breaks a week later. There just never has been a perfect solution for everything. At least that was my impression before RAM Mounts sent us their X-Grip. The X-Grip may be universal, but don’t say it in the same breath as any other mount. Out of the box you can feel it’s quality, by its weight alone. There is as much, if not more, metal in the X-Grip as there is plastic. If you accidentally drop it it won’t shatter into a dozen pieces. If anything it might chip the asphalt where it landed. These are the people who make nearly bomb-proof center consoles for police cars after all. Don’t let the heavy-weight quality worry you though, the suction cup and other mounts don’t fail, but I’m getting ahead of myself. The X-Grip has two spring-loaded arms that are joined in the center to make an X shape. You can easily put in your device and it is held tightly by the rubber pads on each end of the X’s “feet”. The minimalism of the feet mean you’ll easily be able to access buttons and plugs around the device. 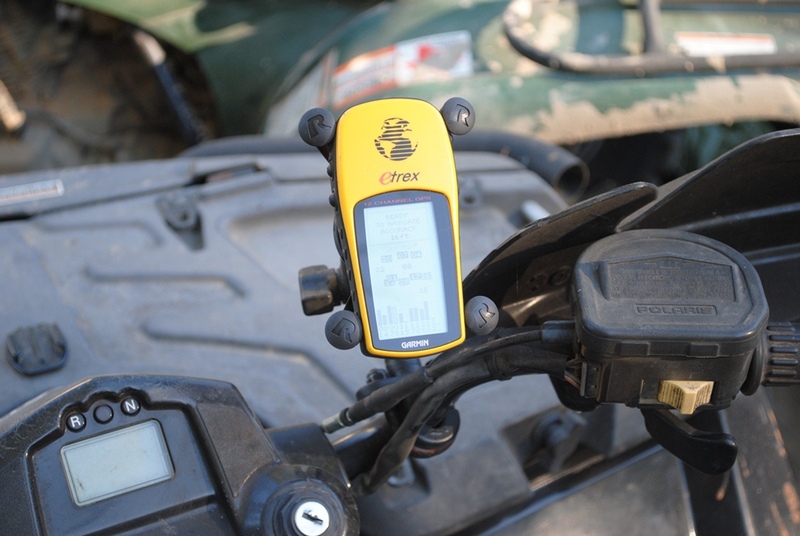 The X-Grip’s size is perfect for smart phones in the Apple iPhone range, we also tested it with a TomTom One GPS and SCT Livewire, though the Livewire fit was snug. It was also a good size for our Garmin eTrex GPS. The feet can go as small as 0.875 inches and as large as 3.25 inches. The depth measures 0.875 inches as well. The back of the X-Grip features the RAM Mounts ball mount. This attaches to an included arm with sockets on both ends. 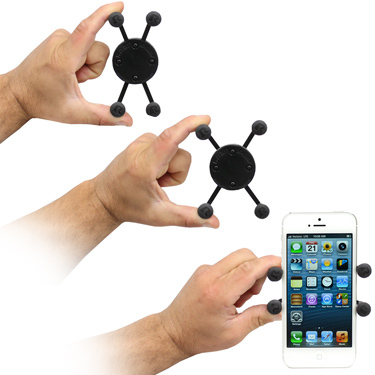 This gives you an endless amount of articulating to place your devices exactly where you want it to be. This arm has a handle in the middle that tightens the grip on both ends. Once you tighten it down it’s not going to move at all. Not even if you try a one-handed adjustment while heading down the road so make sure it’s where you want it in your pre-flight check. The final piece of the X-Grip depends on your needs. 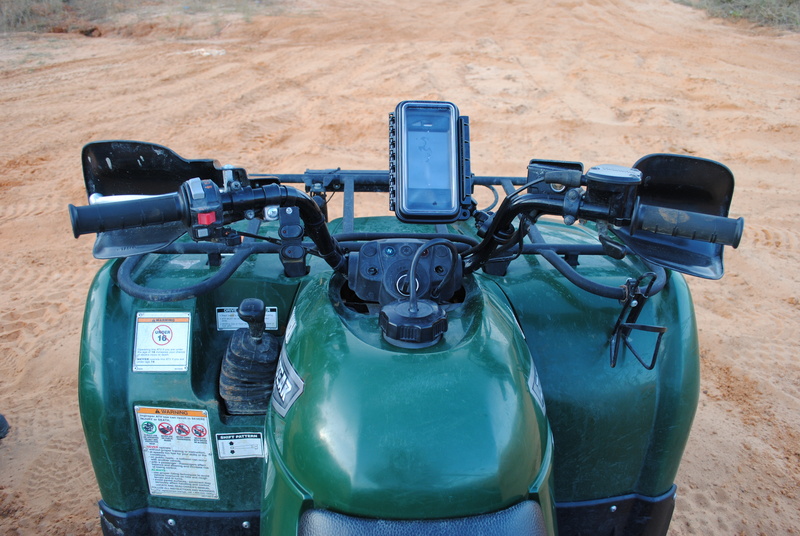 Our unit came with a suction cup mount, but there are mounts for rails, handlebars, cup holders, adhesive mounts, clamp mounts, screw-in mounts and even a mount for your motorcycle’s brake/clutch reservoir. 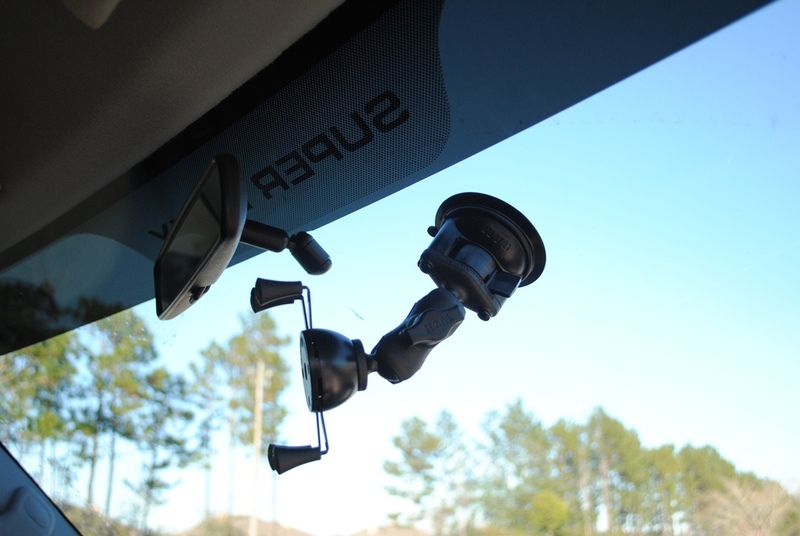 While suction cups are often known the fail the secure clamp on this mount never had us worrying despite some abusive roads on our road trips. The RAM ball mounts make it easy to move the X-Grip (or other RAM Mounts products) between settings. 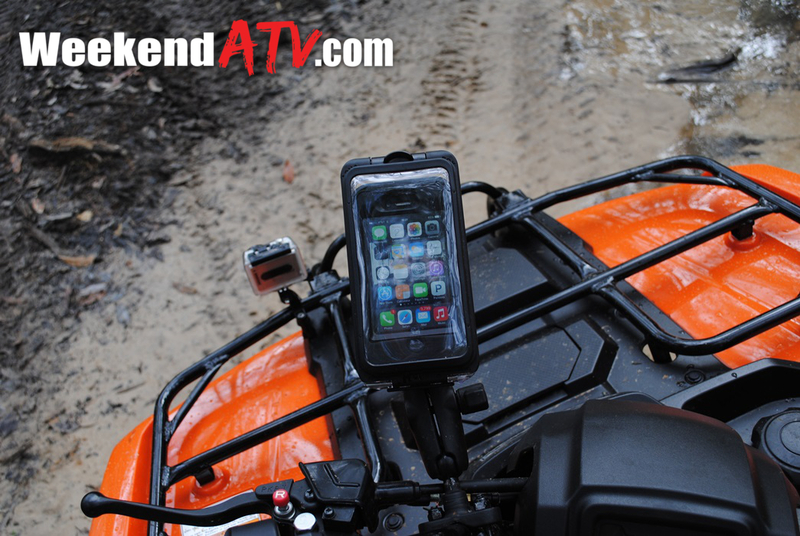 Our X-Grip moved easily from our truck windshield to our ATV handlebars in place of our RAM Mounts Aqua Box allowing us to swap a handle bar mounted iPhone for a handheld GPS. If you have already bought into how incredible RAM Mounts systems are then adding the X-Grip will only set you back another $22.84 (Part number RAM-HOL-UN7BU). If you don’t have any mounts then a X-Grip set starts at $30.41 with an adhesive mount and goes as high as $65.13 with a cup holder mount. Considering the replacement mount for my busted TomTom One is $24.95 the X-Grip is a deal. And chances are it will work on the next device you get too. Interested in carrying a tablet or Apple iPad? They have an X-Grip for that too! 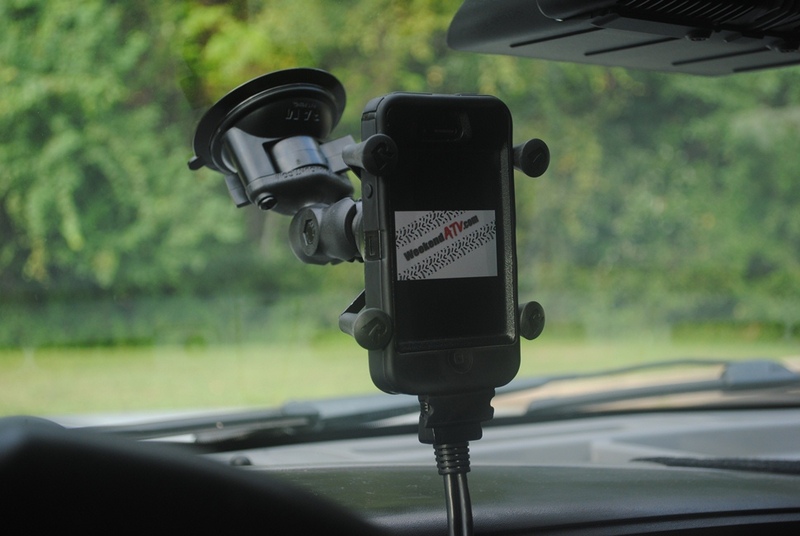 For more details or to order a Made in America X-Grip for yourself check out RAM Mounts at http://www.rammount.com/NewProducts/RAMxgripmount/tabid/4515/Default.aspx. This trail might not be a good option today. Admittedly, most of these aren’t particularly new items. 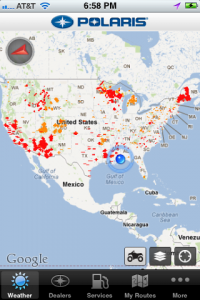 Most smartphones have built-in maps, GPS, weather and can easily locate the nearest fuel, food and lodging. There are also apps for tracking our routes and adventures. However, there are few options that combine all of this info in one convenient app that is directly targeted at riders like you. As a bonus, there are thousands of trails already posted in the app. 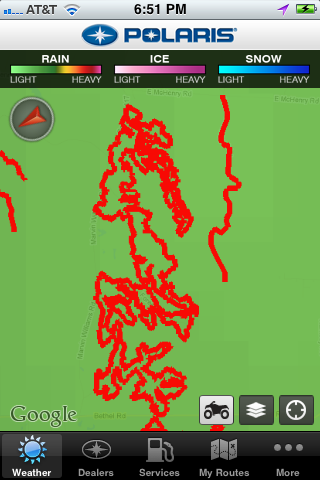 It also provides a unique method for mapping areas you may often ride, but have trouble seeing in full due to tree cover. The ability to place waypoints is a great feature too. Think “great hunting spot” or “great view from here”. The number of uses is endless and certainly not limited to ATVing. The red and orange represent trails. Cell phones are a crucial item for most everyone. 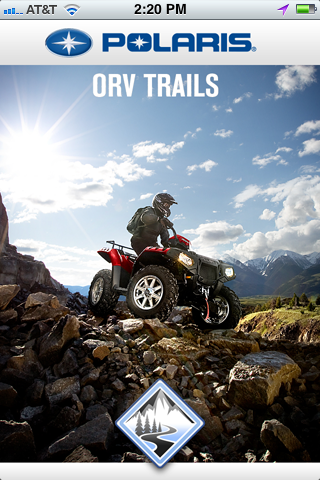 Trail riding is no exception to this. There have been many times when my trail buddies were trying to call me and the calls went unnoticed while I was bounding down the trails. So I was super excited to pick up a RAM Mounts Aqua Box. I have used RAM Mounts equipment in vehicles so I was familiar with the quality. I ordered the RAM-B-149Z-AQ2U from GPSCity.com. 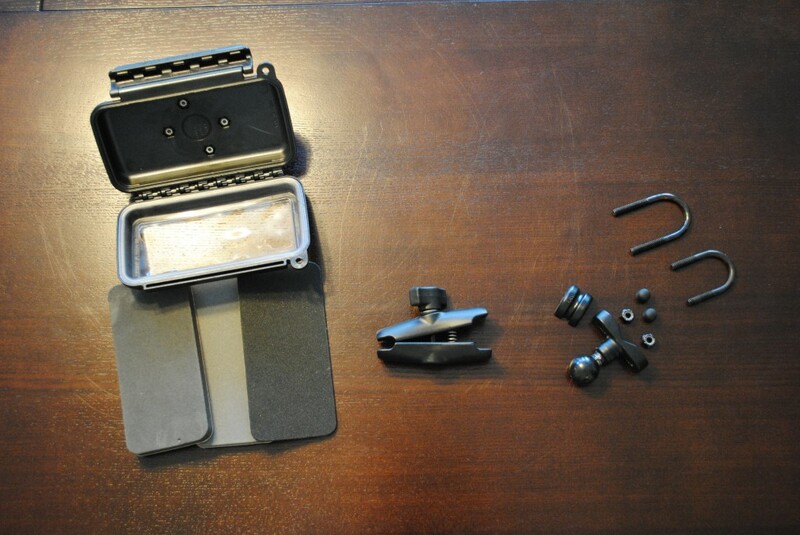 The kit contains three separate items: a handle bar mount, arm and a Medium Aqua Box. According to RAM, the internal dimensions of the medium box are 2.88″ wide, 5.75″ high and 1.188″ deep. Three foam pads of different thicknesses are included so your device is well secured inside the box. Alternative kits are made with smaller or larger Aqua Boxes. I found the medium sized Aqua Box to be perfect for my Apple iPhone 3GS in its OtterBox Defender case. Assembly is a snap and took less than 10 minutes. The flex lens is not hard to install but it seems a bit awkward at first. RAM offers a video on their website to clear up any confusion. The ball joint system that RAM uses makes mounting extremely flexible. The kit includes mounting hardware for different sized handlebars. The box is waterproof and though you can’t fully use the iPhone touchscreen through the Aqua Box flex lens, you can easily see calls and messages when they come in. Simple screen touches work fine but sliding functions do not work. The box also has a punchout that can be used to route wires from the device. The case design should maintain its water tight abilities even with this option used. During an hour long trail ride, there was no movement at all from the RAM system. It held solidly in place and the safety of my iPhone was the last thing on my mind. I did panic a time or two when I realized my phone was not in my pocket, thinking it had fallen out while riding. I was quickly reassured to see it staring back at me from between the handle bars. I consider this a must have add-on for any trail rider and I will be adding it to my other quads. MSRP from RAM Mounts is $68.92. The system is covered by a lifetime warranty with the exception of the replaceable flex lens. Lenses are about $5 from RAM. You can see this and their other offerings at http://www.ram-mount.com/.